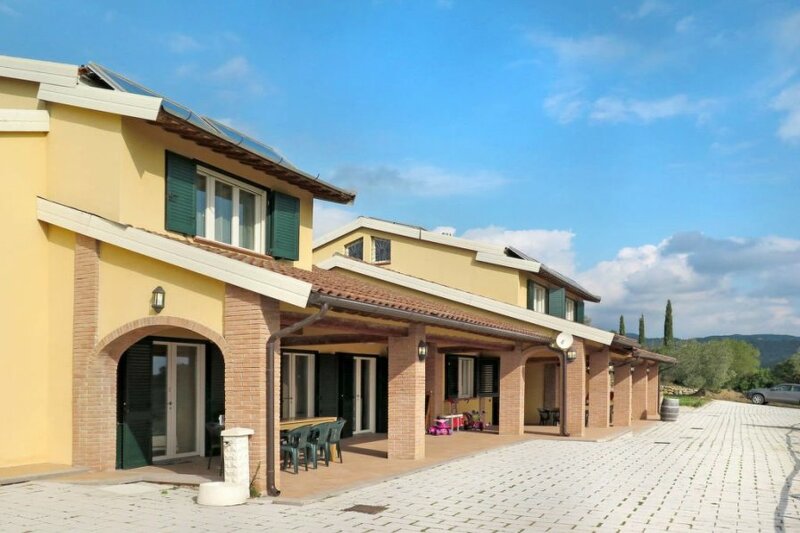 This 10 bedroom villa with private pool is located in Riparbella and sleeps 24 people. It has WiFi and barbeque facilities. The villa is near a beach. Terraced house, 20 - 24 people, 13 room/s, 10 bedroom/s, 6 bathroom/s, approximately 330 m², 2 floor/s, year of construction 2011. Please note: No internal connecting door between the separated properties. Furnishing: good, modern, tasteful, tiled floor, parquet floor, wooden floor. Equipment: TV (3 TV(s)); internet access Wi-Fi (included); washing machine; gas central heating. Gas if applicable also for heating according to consumption approximately € 1.80/​liter. Holiday resort tax. Linen/towels available. Change of bed linen/​towels every 7 days included. Deposit € 400 for occupancy up to 10 persons, € 600 for occupancy by 11-24 persons (in cash). Cot 3x available, only within the maximum occupancy, free of charge (on order). High chair 2x available, free of charge (on request). Pet 2 animals allowed (please advise prior to arrival). Situation: in the district Sorbugnano , altitude 170 m, panoramic view. Access/parking: gravel road, approximately 500 m, not recommended for cars with low ground clearance. 10 x parking on the estate. Access to the house via steep footpath. Estate (private use): approximately 3 ha, open plot, in a hillside, terraced, meadow, olive trees. Garden maintenance by the gardener 1 time/s per week. Outdoor facilities(private use): terrace 120 m² (roofed), furnishing provided (3 garden tables, 24 chairs), brick barbecue. Pool (private use): 13.0 x 5.0 m, 1.00 - 1.30 m deep, 26/05/19-29/09/19, curved shape, children's pool. Pool area: tiled, sun loungers, 3 sunshades. The villa is described as good value for money. It has a private pool and is located in Riparbella. The nearest airport is 53km away. It is set in a convenient location, just 0 metres away from a beach and 4km away from the city center.